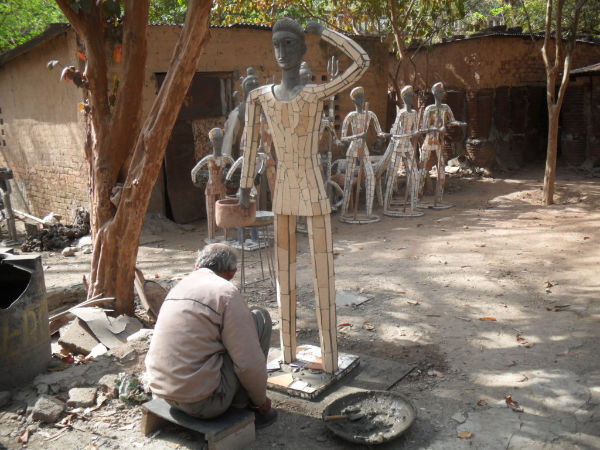 Volunteers groups stay for one month at Nek Chand's Rock Garden of Chandiagrh. Accommodation is provided in the mosaic buildings within the garden walls and meals are served twice daily. The cost per person is £350 (GBP). 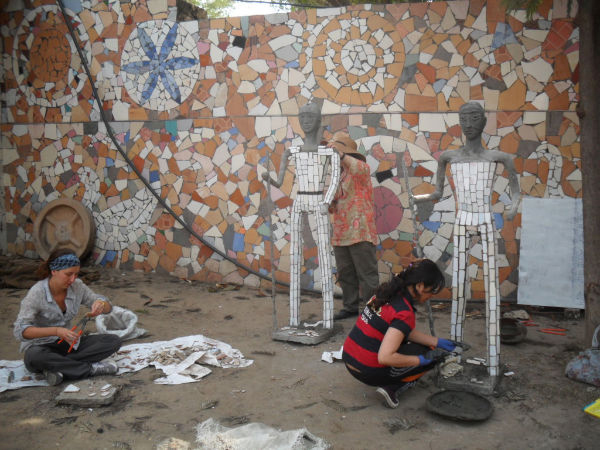 Volunteers work mainly on sculptural and mosaic projects, helping complete the final phase of the Rock Garden, the world's largest visionary environment. Rubbish collection and cleaning are often the first activities of the volunteer groups before they move on to more artistic work. Other volunteers have carried out surveys, made signage, cleaned water pools, removed graffiti and repaired damaged bangle figures. Volunteers need to be able to cope with travelling in India and be self-sufficient enough to carry out their own work plan at the Rock Garden if needed. As funds trickle in, the Third Phase of the Rock Garden slowly nears completion. One of the world's largest ever mosaic projects is now in progress, with work being carried out by international volunteers, children, unskilled labourers and squads of soldiers sent to the Rock Garden to learn techniques to be used in making mosaic sculpture gardens at Indian army bases. The Chandigarh Administration collect all the gate money to the Rock Garden, about £350,000 per year, yet the management structure is not always clear. Therefore it is not always easy to have an organised work programme or structured activity for volunteers. If volunteers find at any time that there seems little response for their need to make progress with work at the Rock Garden they need to be resourceful and sometimes think themselves what might be helpful, and needed, and try and achieve that.